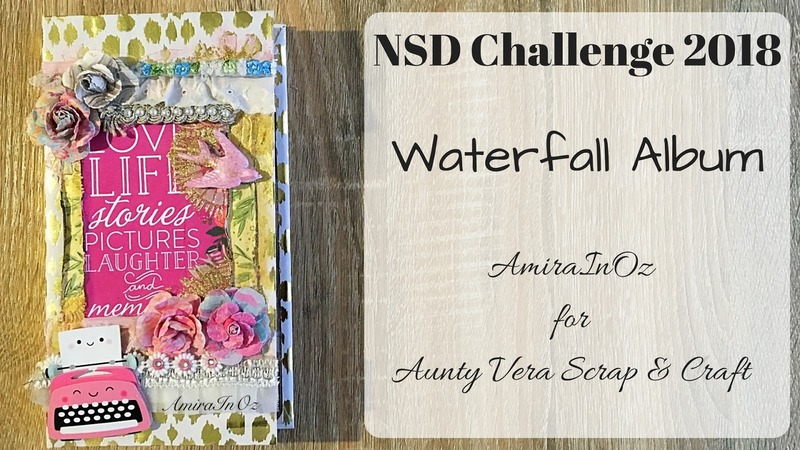 Im back to bring you the final challenge in Aunty Vera Scrap & Craft's National Scrapbooking Day Creative Team Challenges for 2018. Today, I made this project for Donna's Waterfall Album Challenge. The front cover is my attempt to 'get fancy' with stencilling, Prima Flowers, lace, trim and much more. Love this adorable little Doodle-Pop Typewriter sticker from the May Kit. And I managed to attach the polymer bird embellishment by Scrapberry nicely with a dab of hot glue. On the inside, it looks a little drab now but once I have my pictures printed and adhered, it'll be just as fancy as front cover I promise. For the tutorial and video tutorial of this project, head on over to Donna's Challenge over at Aunty Vera Scrap & Craft's NSD Challenge Month. You should also check out THE PRIZES you could win for entering the challenges. Happy (Inter)National Scrapbooking Day from me to you. I hope you get to make this album - it's nice to make one your very own! !